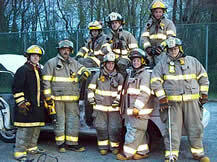 to join the Goshen Volunteer Fire Company. Applicants must be residents of Middle Township Fire District No. 4. Regular member applicants must be at least 18 years of age. Explorer Post applicants must be between 14 and 18 years of age. Ever wanted to be a firefighter when you were growing up? Goshen Volunteer Fire Company is taking membership applications. still fight fire and perform the other tasks not involved with entering a burning building.